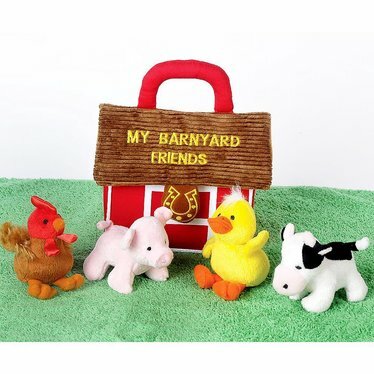 Our Barnyard Friends Plush Set is OUT OF STOCK, but we have ordered more! You are still able to purchase it now and we will ship it to you as soon as it arrives. Questions? Please call 1-800-438-5346 or email us at info@Lehmans.com. We fell in love with these four cuddly friends, tucked inside their soft red barn. But wait until you hear them. The duck rattles. The pig squeaks. And give a gentle squeeze to the cow and rooster, and you'll hear their charming moo and cocka-doodle-doo. Truely adorable little farm set. I gave it to my grandson when he was about 7 months old and he has never grown tired of the little animals. Very well constructed and the animals wipe clean when they get a little smudged up from little hands. This was also a first Christmas gift for my granddaughter and I am sure her new brother will love the cute and interactive farm animals in a few months. I have given this as a new parent gift and the mothers have loved this! I can still picture her cute smile and excited finger-wiggling when I gave this toy to my granddaughter. It is very well made, adorable (especially the rooster) and sized perfectly for little hands. They just need a little help with the closure on the barn. Wanted to surprise a new Grandma (and dear friend) with something special. This was IT! She and her granddaughter are having a bang up time with her Barnyard Friends. Just right for little hands. Lots of giggles too! This was a gift for our great granddaughter's first Christmas. She will be one in January and her parents couldn't wait until Christmas to let her open her first present. According Mom and Dad, she loves all the soft farm animals very much, but her absolute fave is the little duck! Thank you for such a perfect first Christmas gift for our first Great Granddaughter.